A baby's skin is very delicate and doesn't need a lot of products applied to it - but it does need to be kept clean and dry. If you take a look through the drug store isles, there are a multitude of baby powders out there. Many of those powders contain TALC (talcum powder) which you may already have heard some negative information about. For the last 30 years, scientists have closely investigated talc particles and found dangerous similarities to asbestos (see a link to additional TALC information at the end of this post). Some companies have yielded to the public outcry for more “natural products”. 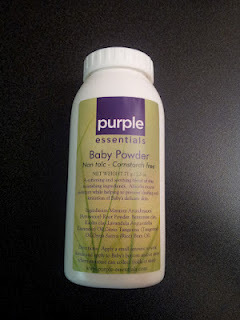 Many now offer cornstarch based baby powder, which would be a wonderful contribution, as it is natural and gentle to baby’s skin. But cornstarch is reported to actually feed yeast (they tend to thrive off of it), which can worsen a yeast/thrush infection. Anyone who has tended to a baby with a painful diaper rash, knows: you do not want to "feed the yeast"! 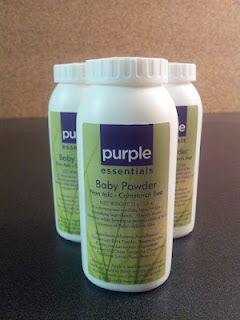 our Non Talc & Cornstarch Free, Baby Powder! A natural softening and soothing blend of arrowroot flour, with moisture absorbing Kaolin Clay and Pink Clay, along with a light, calming scent of Lavender and Tangerine, pure essential oils. Powder lightly at every diaper change, paying special attention to the creases in those cute, chubby thighs. Always be careful not to create a “cloud” of powder, you don’t want your little one inhaling the fine particles, no matter how natural they are. Useful with prickly heat/ heat rash. Helps to keep skin cool and dry. For Diaper Rash: Keep diaper area clean, dry, and exposed to the air as often as possible. Purple Essentials Baby Powder can also be mixed with water or plain yogurt to help relieve diaper rash and yeast infections. Coming soon - Organic Baby Wash and Baby Butter.